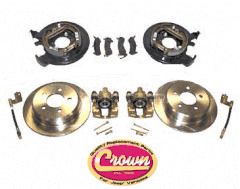 Disc Brake Conversion Kit, D35DISC-2 Fits 1987-95 YJ Wrangler, 1997-06 TJ Wrangler, 1984-01 XJ Cherokee & 1993-98 ZJ Grand Cherokee with a Dana 35 or Chrysler 8.25"
Home > Disc Brake Conversion Kit, Fits 1987-95 YJ Wrangler, 1997-06 TJ Wrangler, 1984-01 XJ Cherokee & 1993-98 ZJ Grand Cherokee with a Dana 35 or Chrysler 8.25"
Disc Brake Conversion Kit, Fits 1987-95 YJ Wrangler, 1997-06 TJ Wrangler, 1984-01 XJ Cherokee & 1993-98 ZJ Grand Cherokee with a Dana 35 or Chrysler 8.25"
Kit Includes: Pads, Rotors, Parking Brake Assembly, Calipers, Mounting Brackets, Brake Hoses and Hardware. (This kit does not include the Parking Brake cables.) A MUST for vehicles with oversize tires. There is no drilling or fabrication needed. 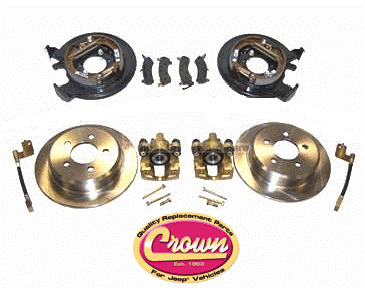 Greatly improves the braking of Jeep® Vehicles.